Home Features What are Aldi Seasonal Favorites? What are Aldi Seasonal Favorites? 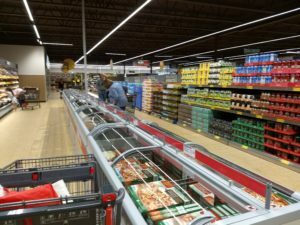 Anyone with experience shopping in Aldi knows that there are two basic kinds of products: the things that are there all the time and things that are only there for a limited time. The things that are there all the time are … well, there all the time. On this site, we call those things Regular Buys. They are the things that, day in and day out, are found on Aldi shelves, and they are restocked regularly. Whether it’s a staple like bread or laundry detergent, these products typically don’t change. Occasionally, Aldi will discontinue, or add, Regular Buys, but once there, they tend to stay for a while. The things that are for a limited time are another matter. These are things that show up in Aldi’s weekly ad and then appear on shelves, but once they’re gone, they’re gone. They don’t get restocked, at least not for a long time. In the United States, these are called ALDI Finds, although they have other names in other countries. There is, though, a third category of products. These are products that show up on Aldi shelves, and stay around for a while — usually, say, several weeks to a few months. These appear to be a recent development in the Aldi inventory; while they may have appeared before then, the first time we saw them was in 2017. That year, they were known as Seasonal Items. However, in 2018, they were rebranded (slightly) as Seasonal Favorites. The most common Seasonal Favorites are foods and products related to a specific season of the year. For example, Aldi dishes out a pumpkin roll during the fall holiday season that tends to persist on shelves for several weeks. Aldi also rolls out a roast duck for about the same amount of time. Some Regular Buys have even become Seasonal Favorites. The best example here is probably Bake House Creations Pie Crusts, which were Regular Buys for a long time before disappearing … and then reappearing as a Seasonal Item (and now a Seasonal Favorite). While not all customers were happy that the pie crusts were no longer a year-round thing, the crusts are still a common sight in Aldi stores at least through the November and December months. Here’s what it means: if you see a product marked as a Seasonal Favorite and you want it, you should get it. Because while it might be around for some time, it won’t be around forever. why did you stop carrying Crimson Tomatoes? They are the VERY BEST I have ever had.